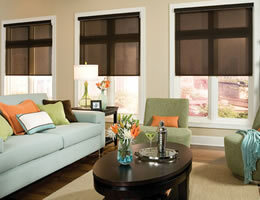 Made from environmentally friendly fabrics, our EcoGreen Solar Screen Shades offer both style and function. Committed to high quality, environmentally responsible window coverings that both help conserve the environment and beautify your windows. View the optical properties of the EcoGreen Solar Screen Shades. 3% openness factor on the fabric. 100% Recyclable Each EgoGreen fabric is completely recyclable to help keep our landfills free and preserve earth's resources. LEED Certification-friendly EcoGreen fabrics help toward the achievement of LEED certification by contributing toward Energy Performance, Material and Resource Use, and Indoor Environmental Quality. Each EcoGreen Solar Screen Shade is also fire resistant and complies to national fire standards. Made from translucent sheer fabric screen material not for complete privacy. What percent visibility are these shades? 3% or more? The fabric is a 3% openness pattern. The solar blinds are exactly as advertised, and I am thrilled with their quality. The solar blinds are exactly as advertised, and I am thrilled with their quality. Can see out but not in, easy to install, easy to operate. Highly recommend to others looking for combined solar panel performance/visibility with privacy. WOW! Awesome blinds! No Smell is perfect for our allergies. I am really impressed and thankful for your blinds! We love them! The blinds work great keeping out the hot sun.